Unfortunately, 90% of people are proficient in either one of these skills. It is almost impossible for a human to have all the three skills at the same time and be good at it. While graphic design and writing go hand in hand, people who have a good artistic vision usually struggle to code. Websites with splendid graphics are poorly coded and websites that are well coded have a poor quality of graphic design. Fortunately, for all the young ambitious entrepreneurs who wish to start successful business, Webflow top free website builder comes across as a blessing. Webflow free website maker is a unique portal that helps you design beautiful responsive websites without even having to know or learn coding. It lifts the heavy burden of hiring someone for a big pay and constantly worrying whether he will get you the desired results. With the help of webflow you can now easily design a website of your liking and it will generate an HTML/CSS code automatically! Create professional websites without learning to code. Some unique features of webflow make it one of the best website building portals out there. As a designer, all you have to do is design and the code will be generated automatically. The generated code is not just a mock-up, it is ready to go live. Since the code is generated automatically, you don't need to spend hours or sometimes even days writing your own code. Your design is ready? Well, then your code is ready too. Designers make the website, not coders. Beautiful responsive websites can be created right from the word go. Don't worry about the appearance on various devices. Webflow has it all figured out. The designs are responsive by default. Designing is as easy as drag and drop. Drag an item and drop it where you like. No complex designing procedures. No incomprehensible tools. Just the basic design interface. Minimal and effective. Lack enough time to spend on website building? No worries. Webflow provides thousands of pre-made templates to get started with. Give them your own customized look. Webflow is as easy as drag and drop unlike most other website building softwares out there. Simple, minimalistic and effective interface helps you create beautiful responsive websites in minutes. All the core components needed for the perfect design are available along with custom widgets for the right look. Webflow lets you create amazingly responsive websites right from the word go. The websites work in mobiles, tablets or any other electronic device and adjust according the size of its display. Irrespective of the size and resolution of the display, whether you are viewing it in portrait or landscape mode, your website still looks stunning. Good thing about webflow is that it comes at various prices according to the usage and affordability. Free - The Free version is for the beginners who have just started web designing and want to explore this new modern age art. This is basically to encourage all the designers to get started with. Micro - The micro version is for those who have their own website and are absolutely committed to it. This version gives hosting options for one website as well. It costs only $14 annually. Personal - This version comes with options for multiple website hostings. Ideally suited for those who are well into designing and have multiple projects at hand. It costs $20 annually. Professional - Ideally designed for freelancers this version allows 50 web hostings and provides extra features like password protection and HTML export. It costs $35 annually. Team - This is the ultimate designing tool which helps different members of a team collaborate together and create the most beautiful and stunning websites. It provides all the available features and costs $70 annually. 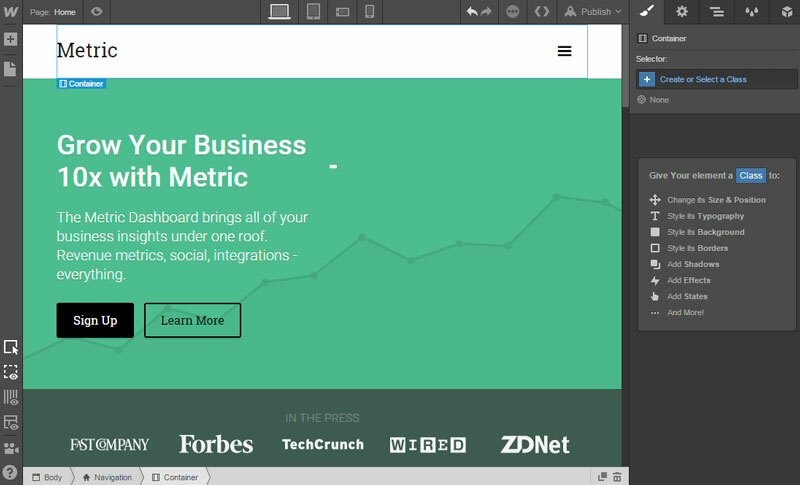 Webflow is one of the best website building tools available anywhere in the market. Its ease of use, responsiveness and auto generated code makes it not just easy but also interesting to use. Being a designer myself, what I like the most about it is that it has successfully managed to integrate designers with the world of coding and it’s beautiful. Makes work easy and we don't even have to rely on others to get it right. The number of benefits it provides is just work spending my every buck for. Never have I loved designing so much before I came to know about webflow. I will purchase the premium version of it very soon.